I*m with you on the Porsche want as that*s been a dream car of mine since childhood. Someday! 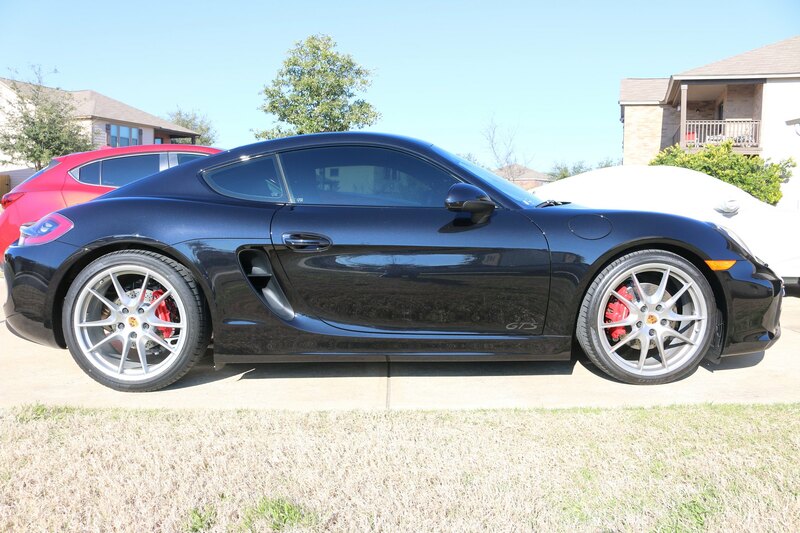 Ah yea and the Cayman is the one I want too. (Though I wouldn’t turn away a Macan as a daily). The bit about the number plates was crazy! I just had to pay $100 to not have a front plate. Perhaps it's semantics I am disagreeing with here, but the 2.5L NA is plenty "fast enough". Again I am at elevation relative to a lot of folks on this forum, yet on freeways find myself at 80-85 mph without even trying and have to slow myself back down. Have highway driven I-80 through Wyoming at 100+ mph. Have driven the very high elevations of I-70 through Colorado on my way to Utah at 80-85 mph in parts. So the 2.5L NA is " fast enough". The better semenatics to use here is that it loses some of its oomph and pep at the higher speeds, so if you pull out to pass someone going 75+, might take you an extra second or so, but make no mistake it will do it. Turbo I'd hope helps eliminate that. That seems to be the crazy ridiculous madness that is driving me. The willingness to spend wildly for a status is beyond nuts and yet it is eating me inside like an extreme mid-life crisis gone berserk. If you can afford it...your money. Live on your terms. This is clearly subjective. I agree the 2.5 NA is definitely sufficient to get the car to those speeds. Need to plan that pass more. Some just want it faster. The 2.5 NA drivetrain among the 3, 6 and CX-5 best suits the CX-5 in my opinion. This is for Gen1. The 2.5 Turbo was developed for CX-9 and thrown into the CX-5. You can see the fuel economy is same as a FWD CX-9 which is a much larger and heavier car. 2.5 NA is perfect unless you are driving in the 70-100 mph range which is perfectly legal in some parts of USA. The NA is very much at home under 60 mph which is urban / city style. See what suits you. Btw 2016 CX-9 is still the #1 Mazda in terms of overall refinement and build quality and that still holds true. Car & Driver posted a 0-60 time for the 2.5L FWD CX-5 at 7.8 seconds. That is the model I would choose if I were you. Wow, hella difference vs. what I read (of course, no longer remember my source). 7.8 < 8.6 = better. Thanks. NA is perfect unless you are driving in the 70-100 mph range which is perfectly legal in some parts of USA. The NA is very much at home under 60 mph which is urban / city style. See what suits you. Ha, both suit me. I'll routinely do 70-75 on the freeways around here, especially when overtaking. Oh well, the local dealer is right next to an on-ramp, so I'll give 'em both a whirl. Ah yea and the Cayman is the one I want too. (Though I wouldn*t turn away a Macan as a daily). The bit about the number plates was crazy! I just had to pay $100 to not have a front plate. Porsche .... there is no substitute! You should definitely go test drive one but be careful ... they are extremely addictive! This is after I had it tinted and PPF'd (Paint Protection Film) added to it. Last edited by russbert; 01-31-2019 at 01:43 PM. If you go for a FWD - make sure you get good tires always - I went to Altimax GTs which are ok on all fronts but 2nd time I might go with something having more grip. Gen1 struggles to put power down after 70-75 mph. The power band drops off drastically. Good ties + FWD or AWD mitigate it to an extent and ofcourse Gen2 is not bloated as Gen1 was - that helps with wind resistance too. I know I shouldn't covet another man's car but...*.